Home Education	FINAL LAST CALL!! YMCA Camp Harrison End of Summer Session 9 NEXT WEEK! FINAL LAST CALL!! 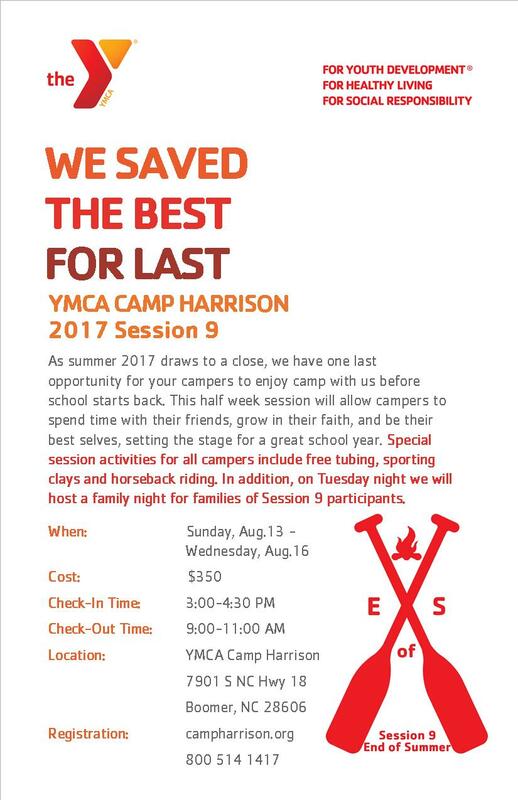 YMCA Camp Harrison End of Summer Session 9 NEXT WEEK! This is the last reminder for your very last chance at the most amazing summer camp in our state! Our Smarty friends at YMCA Camp Harrison saved the BEST for LAST! And at a Super Smarty Steal – $350 for Aug 13-16 and FREE activities! Session 9 is perfect for a first-time camper or just for fun to extend summer a little bit longer. We LOVE Camp Harrison – best summer tradition ever! Plan now for your next private swim party at the Quarry at Carrigan Farms!